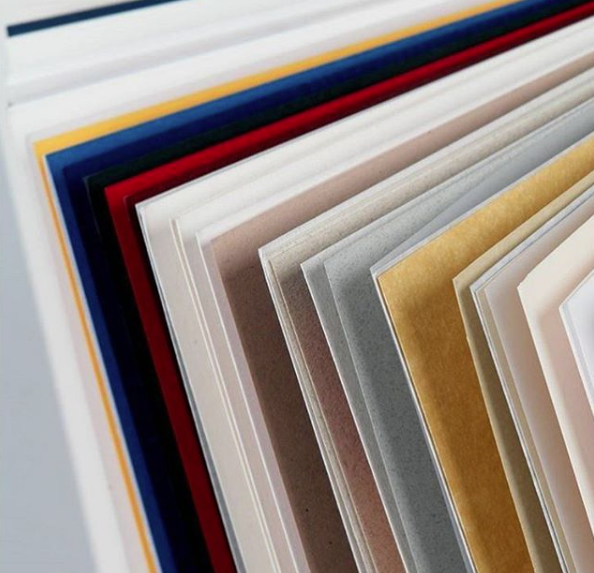 Founded back in 1885, G.F Smith is an independent British paper merchant specialising in fine and unique paper stocks. The pioneering paper consultancy offer a wide range of paper products and are constantly seeking out new papers and processes, specifically catering to the needs of the creative industries. Earlier this week, CuCo had the pleasure of a special visit by the company themselves for an exclusive viewing of this season’s paper collection. Needless to say many ‘Ooohs’ and ‘Aah’s followed as our Design team explored the new collection with all five senses and we were left with what can only be described as a paper stock bible! The collection contains a mix of old and new, including several stocks that have been part of G.F Smith since the start of the business. The CuCo team all chose their individual favourites, but agreed on one thing – the brilliant whiteness of their whitest paper. Brighter, cleaner and smoother than any other, the Heaven 42 paper is visually outstanding and truly illuminates print, gives the best finishes and makes colours shine and pop off the page. Heaven 42 is carefully and responsibly made in Germany, the birthplace of the art of printing. Thanks for your visit G.F. Smith, your collection now stands proudly in our office! For more information about G.F Smith, visit their website at www.gfsmith.com or to bring something extra special to your next print project, call CuCo on 01202 911959. Previous Post: Are retro logos making a comeback? Next Post: CuCo’s brand new website has officially launched!